NORTH HOLLYWOOD, Calif., Feb. 4, 2019––The multi-year transformation of Sunrise Ford of North Hollywood has added another major feature. Bomel Construction, widely regarded as the dean of parking structure construction in the West, recently completed an 834-stall garage, a critical component in Sunrise Ford’s major overhaul. The full-service dealership replaced in 2018 its decades-old facility with a new multimillion-dollar showroom, parts and service center, an essential strategy to remain competitive in the San Fernando Valley’s red-hot auto market. Galpin Ford in nearby Mission Hills was the largest Ford dealer in Los Angeles County in 2017, according to the Los Angeles Business Journal. As the design-build general contractor, Bomel finished the three-level garage in just eight months. The upper two levels of the 315,000-square-foot parking structure are used strictly for inventory. The multi-level garage benefits Sunrise Ford in a number of ways. It centralizes the storage of all inventory to one location. Previously, inventory was scattered about the neighborhood in multiple company-owned sites. The garage is a prominent site for the diverse inventory of cars, trucks and SUVs, many of which are visible from heavily traveled Lankershim Boulevard. 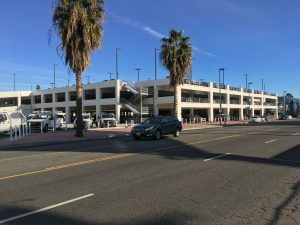 Additionally, instead of a sea of new and pre-owned vehicles basking in the sun all day in an open-air lot, the parking structure represents a shaded, clean and dry haven for the dealer’s inventory. A bridge will connect the second level of the garage to the dealership. “They can drive cars from the garage right into the showroom,” said Bert Williamson, Bomel’s project manager, who spent the majority of 2018 overseeing the project’s construction phase. Williamson said designing the structure to fit within the available suburban space was one project challenge. The garage is south of Burbank Boulevard, just a few feet from busy Lankershim Boulevard and right next to the new showroom. Design and construction of wider bays and a higher-than-normal first deck to accommodate the lube bay and service islands were additional project aspects that differ from most garages Bomel builds outside the auto dealership segment, Williamson said. The height of the first floor is 16 feet, compared to a more traditional 11.5 feet. The service bay portion of the structure is 70-feet wide versus the standard 60 feet. An exterior speed ramp on the northeast side provides direct access to the upper two levels. The white parking structure’s main entrance is on Lankershim. There are entrances and exits on the other three sides of the garage. There are four lanes for customers to approach the garage’s service center. To showcase Sunrise Ford’s inventory, there are no spandrels or crash walls on the upper levels to obstruct the view of motorists and pedestrians along Lankershim. “Normally, we would have a 42-inch-high wall around the perimeter,” Williamson explained. In addition to Williamson, the Bomel project team included Kasey Shay, project executive; Duc Vu, project engineer; and Joe Crook, superintendent. Parking Design Solutions was the architect. “We had a good working relationship with the owner, Sunrise Ford, and the construction manager, United Contractors,” Williamson recalled. This is the second consecutive year that Bomel Construction has completed a parking structure for an auto dealership in Los Angeles County. In 2017, Bomel worked with ConAm Building to erect a five-level garage for the new Toyota of Downtown Los Angeles facility at the intersection of Washington Boulevard and Figueroa Street. The Sunrise Ford parking structure adds to Bomel’s roster of successful projects in North Hollywood. Ten years ago, Bomel completed a 766-stall parking structure and structural concrete work for a nine-story office building, the third-phase of NoHo Commons, a transit-oriented, mixed-use complex developed by Los Angeles-based J.H. Snyder Co.
ABOUT BOMEL CONSTRUCTION: Established in 1970, Irvine, Calif.-based Bomel Construction Co. Inc. is widely regarded as the dean of design-build parking structure construction in the western United States and one of the largest concrete contractors in the nation. It placed 117th on Engineering News-Record’s national ranking of the largest specialty contractors in 2017. In addition to its award-winning parking structure portfolio, Bomel is a one-stop source for all concrete construction needs. The company maintains a highly skilled staff for its in-house structural, architectural and site concrete divisions. Bomel works directly for property owners, developers and general contractors. Its portfolio of work includes a wide range of projects built at large, well-known casino-resorts, shopping malls, office buildings, mass transit centers, airports, universities and community colleges. For more information: Bomel Construction Co. Inc., 96 Corporate Park, Irvine, CA 92606. Phone: 714-921-1660. 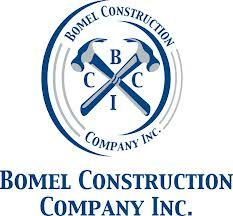 Web site: www.bomelconstruction.com.